They earned the season’s first stage championship and a hefty prize. The Overwatch League has crowned its first stage champion of the second season. The Vancouver Titans defeated the San Francisco Shock with a 4-3 score. The expansion team, built around the former Contenders Korea championship RunAway roster, remain undefeated in this season of the league. As stage champions, the Titans bring home a $200,000 prize for the team—the Shock earn a $100,000 runner-up prize. Unlike the one-sided showings during the semifinals, the grand finals were an even matchup of the highest level of Overwatch play. The entirety of the grand finals was a showcase of main tank talent, but it was most evident in the first two maps, Nepal and Numbani. 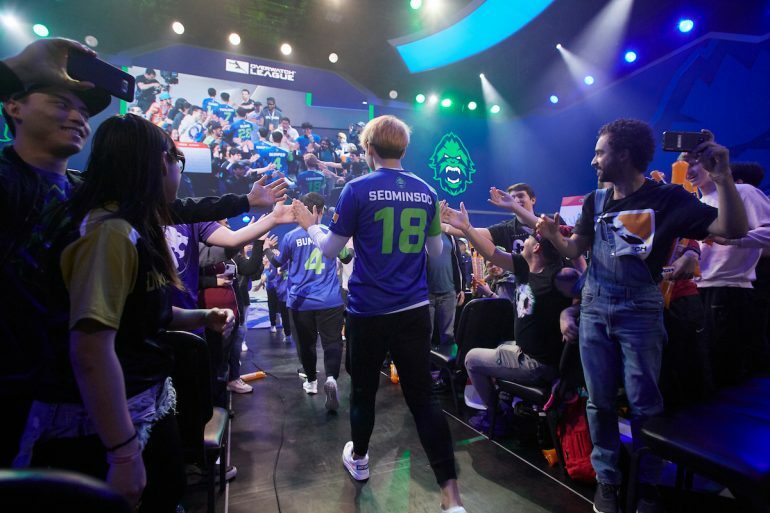 During these maps, the San Francisco Shock rallied to punish Vancouver Titans’ main tank Park “Bumper” Sang-beom’s aggressive Winston and Reinhardt play. Huge Earthshatters from Shock’s Matthew “Super” DeLisi turned the tide for his team on Nepal, allowing Shock to take the first map. On Numbani, the opposite was true, where Bumper’s continuous shatters led to the Shock being full held—and the Titans took map two. Temple of Anubis was the Shock’s pick for the third map, and it was a wild ride. The Titans nearly held the Shock from taking Point A, but a huge D.Va Self-Destruct from Shock’s Choi “ChoiHyoBin” Hyo-Bin took out three Titans players. This allowed the Shock to steamroll and take both points, which the Titans repeated on their own attack. In round two, Vancouver expected to get both points and nearly took the entirety of Point B. Two last-minute kills by Shock’s Park “Viol2t” Min-ki on Zenyatta allowed the Shock to stabilize and deny the Titans. The Shock took Anubis and went up 2-1. Vancouver took the series to Dorado and it was a vacation they sorely needed. San Francisco’s attack was solid, thanks to another huge Self-Destruct from ChoiHyoBin, but stellar coordination from Vancouver prevented the Shock from completing the map. All Vancouver had to do was push the payload past Point B—they easily took the challenge and evened up the map score. Both teams had a score of two as the finals went into a fifth map. San Francisco chose Ilios, which was a back-and-forth throwdown throughout. The Lighthouse round went the way of Shock despite Seo “SeoMinSoo” Min-Soo carrying the Titans with his Zarya play. The Shock gained 99-percent completion on the Ruins round, but a last-minute Earthshatter by Bumper allowed the Titans to take it. With one round to each team, a third round took both squads to the Well stage. SeoMinSoo brought out McCree and demolished the Shock’s healers. After the Titans were forced to switch to a triple-triple composition, however, they couldn’t compete with the Shock. San Francisco went up 3-2 and needed only one more match point to become champions. The Vancouver Titans aren’t so easily swayed, though, and decided to bring the Shock to King’s Row. Expert Zarya play from the Titans’ SeoMinSoo allowed them to complete the map. The Shock were held back before Point C despite clutch plays from Grant “Moth” Espe on Lúcio, booping many Titans into the great abyss. The series was tied at 3-3 and things got vicious as both teams were out for victory. The Shock chose Rialto as the championship map and the round kept everyone on the edge of their seats. The Shock completed the map due to impeccable teamwork from Super and Jay “Sinatraa” Won on Zarya. Just when it looked like the Shock’s championship to win, Vancouver proved them wrong. Big plays from SeoMinSoo and Lee “Twilight” Joo-seok on Zenyatta allowed Vancouver to finish Rialto with the fastest time recorded in the Overwatch League. The map was then repeated. The Shock went into overtime moving the payload to Point A, but were stopped before completing the checkpoint. The Vancouver Titans then had over four minutes to move the payload to Point A. While the Shock managed to stabilize for a short time, the Titans couldn’t be stopped, and took the series 4-3. “I am the happiest man alive,” said main tank Bumper after the win, through translator Danny Kim. When asked if the Titans could win another stage title, Bumper said anything is possible. Stage two of the Overwatch League begins Thursday, April 4.